This is the companion volume to Worship of the English Puritans, and was first published in 1990 by Peter Lang Publishing. Dr. Davies looks at the unique element of Puritan worship in New England. Topics covered include the theology of worship, sermons, music in worship, prayers, the sacraments, and several others. Quotes from many scarce Puritan works are given as part of the text. - Publisher The late Dr. John Gerstner referred to English and American Puritanism as "the most godly movement the Church has known since the days of the apostles themselves." Their teachings, their lifestyles, and their sense of worship grew out of their complete devotion to God's Word and His warrants.^^There were close ties between the English Puritans and their American counterparts. Many of the early American Puritans were men who had fled their beloved England after the lamentable Great Ejection of 1662 to minister God's Word free of state control. In this book, Dr. Horton Davies professor of religious history at Princeton University, explains the theology of Purtian worship; the sermonic style they employed; the Puritan understanding of praises, prayers, the sacraments; and even the theological significance of church architecture, among other topics. Here was worship that was truly God-centered! 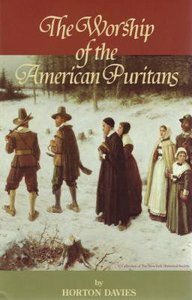 About "Worship of the American Puritans"
The late Dr. John Gerstner referred to English and American Puritanism as "the most godly movement the Church has known since the days of the apostles themselves." Their teachings, their lifestyles, and their sense of worship grew out of their complete devotion to God's Word and His warrants.^^There were close ties between the English Puritans and their American counterparts. Many of the early American Puritans were men who had fled their beloved England after the lamentable Great Ejection of 1662 to minister God's Word free of state control. In this book, Dr. Horton Davies professor of religious history at Princeton University, explains the theology of Purtian worship; the sermonic style they employed; the Puritan understanding of praises, prayers, the sacraments; and even the theological significance of church architecture, among other topics. Here was worship that was truly God-centered! Davies is professor of religious history at Princeton University.